For the most part, Palin herself is an unwitting participant in the burgeoning business. Since the conclusion of the presidential election, Alaska Gov. Sarah Palin (R) has largely avoided the political fundraising circuit. Nevertheless, she’s emerged as an almost unparalleled fundraising force, with both foes and fans minting money off the mere mention of her name. The candidates and causes that have climbed aboard the Palin gravy train include, but aren’t limited to, abortion rights foes and supporters, environmental groups, and political committees supporting both Republican and Democratic candidates. It’s a testament not only to her star power, but to the strong feelings she generates among partisans. 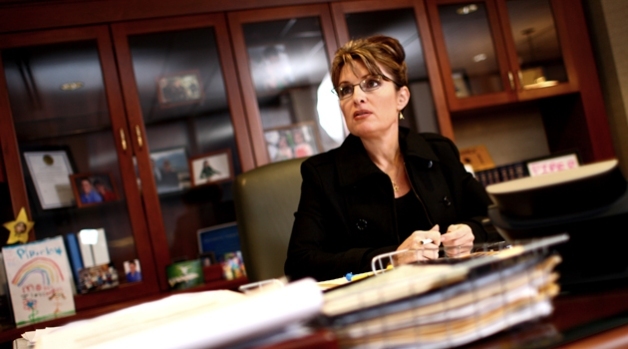 “The only authorized thing out there at this point is SarahPAC. And the rest are just using her name and brand to draw attention and roll in the dollars,” said Meg Stapleton, a spokeswoman for SarahPAC, the committee Palin set up in January to raise money for her political staff, travels and contributions to like-minded candidates. Aside from an early e-mailed solicitation from the group and a Thursday anti-abortion banquet in Indiana that the PAC will pay for Palin to attend, neither the governor nor her PAC have engaged in much in fundraising this year, due to her attempts to focus on Alaska’s legislative session. But that hasn’t stopped others from seeking to fill their own coffers by pillorying her in direct mail, piggybacking on or her stances and symbolism, hinting she might appear at their fundraisers and sometimes even falsely implying contributions will go directly to Palin. With some groups, it’s not entirely clear what the overarching goal is, other than to milk the Palin brand for everything it’s worth. Last month, a different group called Americans in Contact PAC launched a high-tech, multi-state campaign seeking contributions to help re-elect Palin as Alaska governor in 2010, even though its own direct mail included puzzling fine print serving notice that all contributions “are only used in Federal elections." Stapleton said that Palin’s virtual absence from the fundraising scene has created a vacuum that others have used to their benefit. But she asserted that continued intense interest in the Alaska governor will enable her to be a successful fundraiser when she does hit the rubber chicken circuit, regardless of how many groups have tapped her name to raise money. Stapleton singled out an Americans in Contact PAC direct mailer that arrived at the Palin residence in Wasilla, Alaska. Between September and the end of last year – the period covered by the PAC’s only Federal Election Commission filings – Americans in Contact raised $73,000, contributed $1,750 to candidates and paid $28,000 to ccAdvertising for “PAC surveys” and phone and administrative services. Other conservative groups see Palin’s drawing power and pine for her to headline their fundraisers, with some reticent to take "no" for an answer. “I can’t tell how many invitations I’ve seen with ‘Gov. Palin’ in 25-point font and ‘invited’ in 1-point font,” said Stapleton of SarahPAC. The Palin pitch is proving irresistible for both sides of the abortion debate. The Susan B. Anthony List, a group that supports female politicians who oppose abortion rights, began seeing its paid membership spike soon after Republican presidential nominee John McCain tapped Palin – a vigorous abortion rights opponent – to be his running mate, said its political director Joy Yearout. “It’s invigorated us in ways that we could never have anticipated,” she said. The group used Palin in fundraising emails during the campaign, and it’s continued raising money through a passive appeal on a free social networking site it established called “Team Sarah,” that boasts 65,000 members, said Yearout. Palin appears to be just as effective for groups supporting abortion rights. An anonymous viral e-mail asking abortion rights supporters to contribute to Planned Parenthood “in Sarah Palin’s name” generated more than $1 million in contributions in the month after the Republican convention, according to spokesman Tait Sye. And NARAL Pro-Choice America used direct mail and email solicitations targeting Palin to boost its fundraising “significantly” in 2008, said spokesman Ted Miller. “Although she has taken a somewhat lower profile now, if she chooses to reemerge and take on a more public profile in either attacking President Obama or pushing anti-choice policies, our members will respond in kind,” Miller said. Another group that saw its fundraising soar by opposing Palin was the Defenders of Wildlife Action Fund, which raised more than $1 million to air an ad in swing states blasting Palin for supporting aerial wolf hunting. The ad, which was reshot after the election to feature Ashley Judd, continues to boost the group’s membership and fundraising, said fund president Rodger Schlickeisen. “In this age, when a lot of the donors out there look at this administration and this Congress and incorrectly conclude that [on] environment and conservation [issues], their worries are over, it is very beneficial to us to be able to point to Alaska and Palin,” he said. The Democratic Congressional Campaign Committee apparently agrees since it sent out a pair of fundraising appeals blasting Palin last month after the Republican House and Senate campaign committees prematurely announced that Palin would be headlining their June fundraiser. “They have her. We have you,” read an emailed DCCC solicitation with Palin’s picture. It hardly mattered that Palin ended up backing out of the GOP dinner, said Christian Heinze, whose blog “GOP 12” obsessively tracks every mention, movement and statement of prospective 2012 Republican presidential candidates.